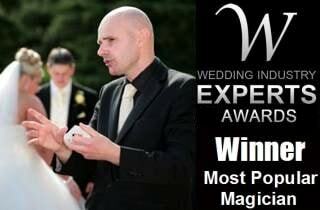 Hiring wedding magician David Fox for your big day's reception will without doubt create a special event to remember. Enthralling party magician David Fox's special brand of entertainment, will leave your guests both stunned and mesmerised. If you are seeking a corporate magician in the Stratford area, look no further! David Fox is the perfect choice! 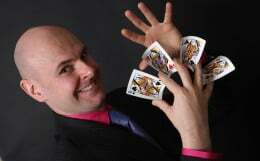 Award winning Stratford magician to satisfy all your special needs. David Fox is Stratford's number one close-up magician and is perfect for all types of special events around Warwickshire. A proud supplier of the Ettington Park Hotel, Alderminster, David won the accolade of 'Most Popular Wedding Magician' at this year's wedding industry expert's awards poll. A recent performance at the Alveston Manor Hotel during Elaine and Steve's wedding reception, earned David some exceptional feedback and he takes great pride in delivering world class performances of card manipulation, magic with day to day items, mind-reading routines and classic illusions. David's unique brand of magic is slick, contemporary and highly engaging. His extensive Midlands client list includes many of the top brands such as Toyota, Hilton Hotels, Barclaycard, British Gas and Sytner BMW. Indeed, David's magic is suitable for all age groups, cultures and people of all social backgrounds. Many tourists flock to visit Shakespeare Country every year and Mr Fox is frequently called upon to entertain coach parties and guests at local hotels and eateries. With many years of experience, David knows how to deliver a highly effective and entertaining performance. This is why he was invited to entertain celebrities at HRH Queen Elizabeth II's Diamond Jubilee celebrations in London in 2012. Why not pop in to see David Fox in action at the Ettington Park Hotel on Christmas Day? For the second year running, he will be entertaining guests during Christmas lunch. Book David now for your special event in Stratford-Upon-Avon, Warwickshire.